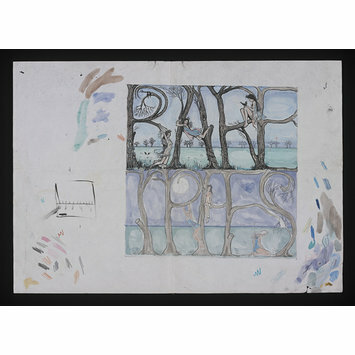 Unused artwork for the band Fleetwood Mac's album <i>Bare Trees,</i> drawn by Christine McVie, singer, keyboardist, and songwriter for the band, ca. 1971. Christine McVie was a member of the band Fleetwood Mac for 28 years from 1970, when she joined after marrying the band's bassist, John McVie. She had already played keyboards, supplied backing vocals and artwork for the fourth album and on joining Fleetwood Mac, she would contribute to song writing as well. Her addition to the band changed its musical direction, leading from a blues style to a pop-orientated sound that would eventually produce the 40 million selling 1977 album Rumours. In 2006, American arts magazine Paste named McVie as the 83rd greatest living songwriter. Unused artwork for the band Fleetwood Mac's album Bare Trees, by Christine McVie, singer, keyboardist, and songwriter for the band, ca. 1971. 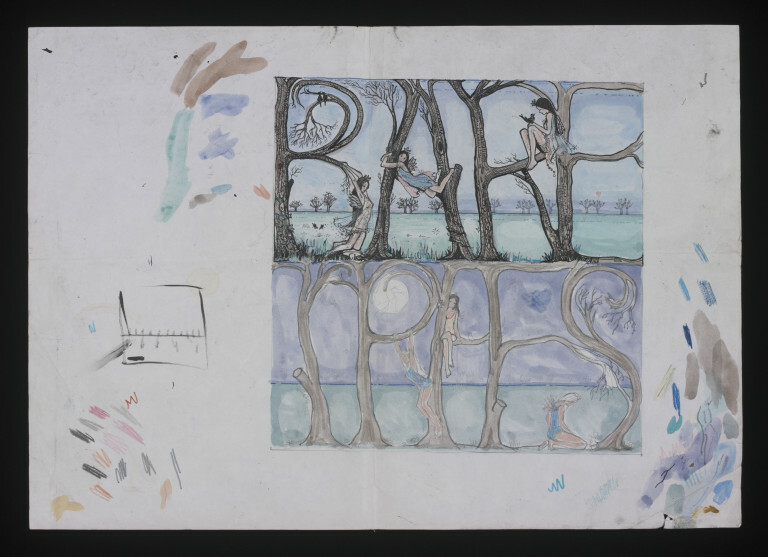 The design shows a square inside which the words BARE TREES formed out of curving tree trunks and branches. Fairy-like creatures are nestled in the letters, which are coloured brown against a blue sky and green field. Around the main design are patches of watercolour and coloured pencil where the colours have been tried out.